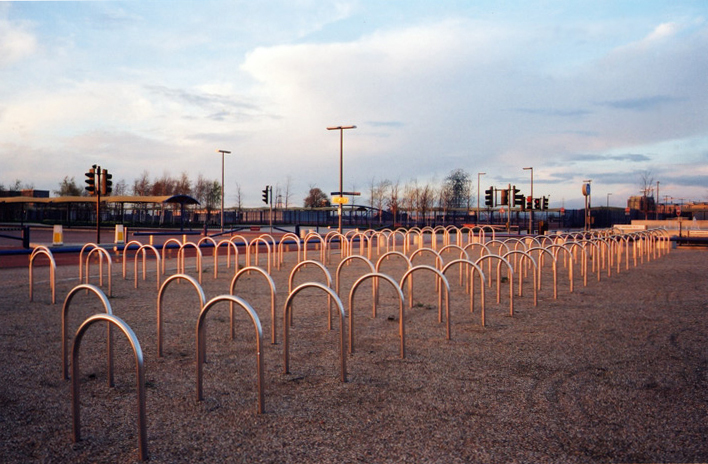 Bicycle hoops, Greenwich Peninsula. Photo © David Secombe 2004. Within a few years, the area had taken on a definite identity, albeit not the one that was in the original brochure, and for most of the 2000s this was the place London forgot; a desolate landscape, one that was fascinatingly wrong, given the ecological and social-democratic ideas that had initially been thrown around in relation to it. A holding pen for Canary Wharf, yet somehow so much weirder than the usual Thames-side developments they inhabit. Alongside Erskine’s buildings – a staggered skyline of rendered concrete towers that would clearly be more at home in Malmö – was a nature reserve and a beach full of discarded shopping trolleys. The views were of industry either abandoned or clinging on, and pervaded by the sickly-sweet smell of the Tate & Lyle works. People were seldom seen, and the highways for cars en route to the Dome were utterly empty. Something resembling a dual hangar housed the ‘David Beckham Football Academy’ while concrete grain silos that would make Corbusier weep in admiration surveyed the area like sentries. While this place was clearly a resounding failure on any social measure, it was a compellingly alien interzone in London’s cityscape. Neighbouring areas might be wracked by seething poverty and violence, but this enclave gave off a post-apocalyptic calm.